← Will be back soon! 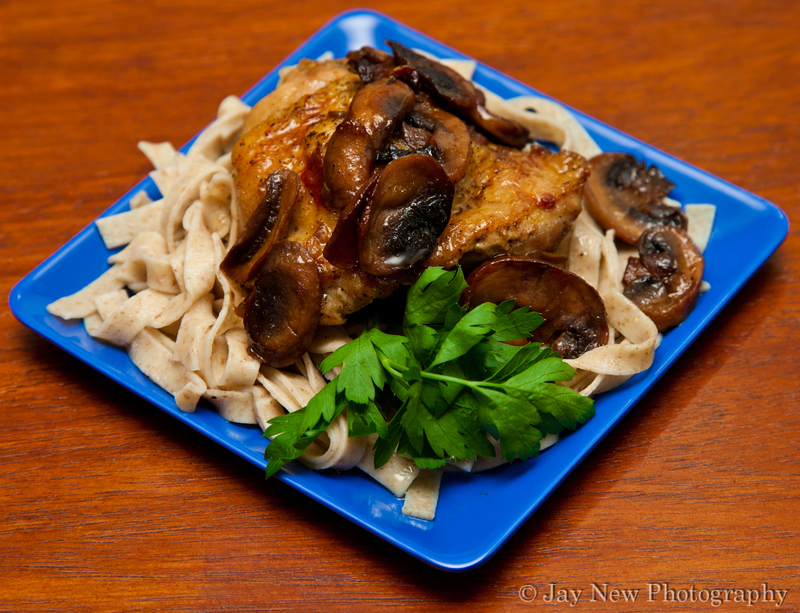 Today I am sharing a very simple..but really delicious recipe for Chicken and Mushrooms. I served mine on a bed of multigrain egg noodles but this can also be served on its own. I had to try my hardest not to add an abundance of ingredients to this recipe. The mushrooms come out FANTASTIC in this dish, so make sure you have a lot of them. I only had half a package of mushrooms and I was sad to say, it was not enough. The only major item needed for this recipe is a large oven-safe frying pan (large enough to hold chicken and lots of mushrooms). Other than that, chicken, mushrooms, salt/pepper, butter and water. Easy enough right? Lets get started. Season generously, both sides of chicken thighs, with salt and pepper. Glad to hear back from you! Hope you are all ok with that allergy. Thanks Rsmacaalay 🙂 I am doing better. It was just a matter of finding out which allergy med actually worked for me (without me falling asleep). That and my husband’s grandfather in the hospital and me and my husband falling ill, its been one thing after another. We are recovering and I have about 16 recipes to write and post about lol. I will be busy! Thanks Lawfullyweddedwife *hugs* I am just about to go over and check out your new look for your blog 🙂 So excited! Mmm… looks delicious, what a beautiful plate of food! Thank you 🙂 Did you see your link on my blog roll? lol the juices from the chicken and the mushrooms…they just made a great gravy! Thanks for the welcome 🙂 I missed blogging! Of course we stuck around Samina, you are an amazing person and an amazing cook. I understand real life needs your utmost attention, but I just want you to know I appreciate you bothering to update; and I appreciate you sharing your recipes with all of us. And this chicken and mushroom dish looks delicious as always. *HUGS* You’re extraordinary, always remember that. Okay, so how does one determine if a frying pan is SFO? That is a good question! If there are plastic handles, it is probably not safe for the oven. Best way to find out is to check the underside of the frying pan. On new pans (that are not too worn yet), it will say if the pans are oven/microwave/dishwasher safe. You can also look up the name and type of pans you have and see if the companies have any information on your pan. I was lucky to have a Calphalon pan, which I used for this recipe. It is oven safe to 450 F.